If you don’t know building construction, then you need to know your building contractor. In the last few months, several homeowners, desperate to have their homes repaired after the flood in the Nashville area, have contacted me when their project didn’t go as planned. Many of these homeowners were told by their contractors to obtain their own building permits from their county codes department. This placed the homeowner in the role of the contractor and the person he/she hired in the role of the sub-contractor. As a result, when subcontractors hired to do the work failed to meet expectations, the homeowner bore the full responsibility for the job and could not walk away from the project in the same way the sub-contractors could. The homeowner, the contractor on record under the law, was stuck with shoddy workmanship and an unfinished project. A woman was having a studio built behind her home. She obtained the building permit, purchased all the materials, and hired a local handyman to construct the building. She watched the construction, but because she had no knowledge of construction procedures, she was unable to identify potential problems. When the building started to sag, she knew something was not right. Unfortunately, instead of correcting the problem, the handyman walked away from the job with his labor money already paid. In the end, the building had to be dismantled and rebuilt from the bottom up. Another woman needed her bathroom renovated. She had her bathtub reglazed, and it peeled after a short time. Next she had a local company cover her bathtub with a tub liner, which was satisfactory to her. However, when she wanted new porcelain tiles installed around the bathtub walls and floor, she hired two local handymen to do the job. The handymen removed the old tile from the floor and walls, installed green board drywall around the shower walls, and installed the porcelain tiles over the green board. As professional contractors, we know that building codes never approve green board in a wet area as a tile underlayment. However, these handymen were unaware of the code requirement and proceeded to install the tile incorrectly. 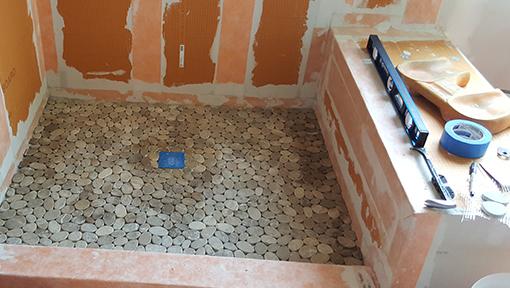 After removing the old tile and installing new drywall, they discovered a one-inch gap between the existing bathtub liner and the newly installed drywall. The tub liner was also flexible, which did not allow them to tile to it. They told the homeowner that they planned to use one-inch of silicone caulk to keep the water from going between the tub and the walls. Even though this homeowner did not have a lot of construction knowledge, she knew something was not right. She decided to fire the handymen and hire a professional contractor who had to tear out the shower, the tub, and the floor and rebuild them correctly. After she called us, the woman remarked that this was a very expensive lesson to learn. A couple purchased an older home that had previously been renovated into several housing units near a local university. In order to expand the living space of two units, they proceeded to enclose two porch areas. They hired what they believed to be a contractor but never checked out his credentials. The contractor asked them to obtain the necessary building permit and then proceeded to renovate their home. The contractor and the homeowner were unaware that porch requirements have different building load calculations than a closed in living space. Consequently, the renovation job was poorly constructed. Water penetrated down through the walls and black mold formed in the walls, floors, ceilings, and insulation, as well as the basement. The contractor left the job saying the homeowner should call his insurance company to cover his faulty construction. Since the homeowners obtained the building permit, the contractor believed he was not responsible because he was merely a sub-contractor for the homeowner. When considering a home remodel or building construction, consider contacting the Home Builders Association of Middle Tennessee (HBAMT) and/or the National Kitchen and Bath Association (NKBA). Request the names of building contractors and remodelers that belong to the association. Ask for recommendations and choose at least three building contractors to interview and obtain a written bid. (You may have to pay for these bids as they are quite comprehensive and time-consuming). In order to minimize any change orders once construction begins, study the three bids carefully to ensure that everything you want is included because changing the project later may be costly. You can also find out if the contractor has any complaints against his/her company by contacting the Better Business Bureau (BBB). Is the contractor licensed as a contractor by the State of Tennessee? You can check with the Tennessee Board of Licensing Contractors (615-741-8307 or email). Is the contractor bonded by a Tennessee State approved insurance company? Ask to see proof of the current contractor’s bond. Does the contractor have sufficient liability insurance? Request to see proof of current liability insurance. Does the contractor have workman’s compensation insurance on all his workers and subcontractors? Make sure everyone on your worksite is insured. Please Note: If your contractor does not have all of these basic credentials, you, the homeowner, could be liable for everything that is done or happens on your property. When you, the homeowner, obtain your own building permit, you are also required to have sufficient liability and worker’s compensation insurance on all the people that work on your project. The value of your home may be placed in jeopardy to cover the risk of Worker’s Compensation Insurance and/or builder’s risk liability. As many homeowners do not own their home outright, your lending institution may also require you to take out builder’s risk insurance. They could foreclose on the property if you refuse. In addition, if you, the homeowner, do not obtain a building permit and proceed with an unlicensed contractor or remodeler, you are fully responsible and liable for everything that happens on your property. It is best to make all your design and material decisions before you sign a contract. This way you can compare the contracts for their comprehensiveness and types of materials that will be used. Be careful when proceeding with a contractor that bids a job with allowances for materials but does not identify them specifically. Some contractors “low bid” the contracts so you will have to upgrade everything on the materials list in order to get what you really want. This leaves you vulnerable to costly change orders. In order for your project to be successful, you have to evaluate the total project cost, quality of the materials and workmanship, dependability of the contractor, and his ability to complete your job in a timely manner, and mutual trust and respect that you have with the bidding construction companies. Respected, honest contractors are out there and are looking for your business.